Last year, Michelle Barnes found out that she was the first American to have been diagnosed with a rare and deadly disease, known as Marburg Hemorrhagic Fever. Marburg virus was first documented in 1967 when a shipment of infected monkeys from Uganda was sent to a laboratory in Marburg, Germany. Laboratory workers, who were involved in manufacturing polio vaccines that used tissue samples from the infected monkeys, came down with a severe, unidentified illness. FRONTLINE/World reporter Serene Fang spoke with Barnes from her home in Colorado about how she contracted the virus and survived. Read how Michelle Barnes’ recovery from Marburg could help develop a vaccine against the spread of the deadly virus. Our taxi driver was slightly flustered. After being waved away from one entrance, he navigated a U-turn in rush-hour traffic and was now trying to deliver us to the front door of the visitor’s center at the Centers for Disease Control and Prevention in Atlanta, Georgia. As we pulled to a stop, several security officers ordered us out of the car and began a rigorous search of the vehicle. We hauled our video equipment to an X-ray machine and surrendered our IDs. This meticulous process is part of the daily routine at the CDC headquarters, home to perhaps the best-known maximum containment laboratory in the world. “We deal with the ‘big bad guys’ of the disease world,” says Dr. Stuart Nichol, chief of the Molecular Biology Laboratory in the Special Pathogens Branch. Behind thick walls, air-locked doorways, HEPA filters, and stringent security measures, scientists are probing the genetic depths of viruses with exotic names like Ebola, Nipah, Lassa fever, Guanarito, and Marburg. There are between 20 and 25 high-containment labs around the world, and only half a dozen of these combine diagnostics, containment, and epidemiology under one roof. And because the CDC lab is considered the “gold-standard” for deadly disease diagnostics, says Nichol, it’s home to a unique collection of disease agents. The Department of Homeland Security funds a substantial amount of the lab’s research, mostly in an effort to increase bioterrorism preparedness through improved detection of pathogens -- substances that could become powerful weapons in the wrong hands. When mysterious and deadly outbreaks strike -- whether in the jungles of Zambia or the mountains of Bolivia -- Dr. Nichol and his team are often among the first to receive a phone call asking for support. In order for the CDC to diagnose the disease, samples must be flown out of the affected country for testing in Atlanta. The tissue or fluid samples are tightly sealed inside plastic tubes and several redundant waterproof containers surrounded by absorbent material. They must be kept cool to protect the infectivity and packaged to withstand the weight of a Mac truck, explains Nichol. Exhaustive transit and customs paperwork must be filed, and each individual pilot must not only be cleared by security but must also personally agree to carry the dangerous substance. Sometimes, says Nichol, after everything else is cleared, a sample will remain grounded on some remote jungle airstrip for lack of an agreeable pilot. 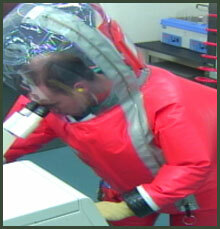 When things go smoothly, disease samples can reach the CDC labs within a few days of being collected. And genetic sequencing is cheap enough now, Nichol says, that a completely unknown pathogen can come in, and within a few days, the team will have unraveled the genetic clues and isolated the new agent. For example, earlier this year, "We got a phone call from Zambia," says Nichol. A paramedic had come down with a fever that looked a lot like Ebola. It turned out that he had recently flown a patient suffering with similar symptoms to South Africa for emergency treatment. The nurses who treated the patient there also fell ill. "So now there’s this chain of five people with the disease, four of whom died," says Nichol. When the tissues were sequenced in Atlanta, Nichol and his team were surprised to find that it was not Ebola, as they had suspected. Through a genetic technique called PCR -- or polymerase chain reaction -- they were able to show in a few days that this was an entirely new virus, which they dubbed Lujo -- a combination of the two cities (Lusaka and Johannesburg) where it was thought to originate.